Keep a visual record of your productivity. Is there a better alternative to nnScreenshots? Is nnScreenshots really the best app in Productivity category? Will nnScreenshots work good on macOS 10.13.4? 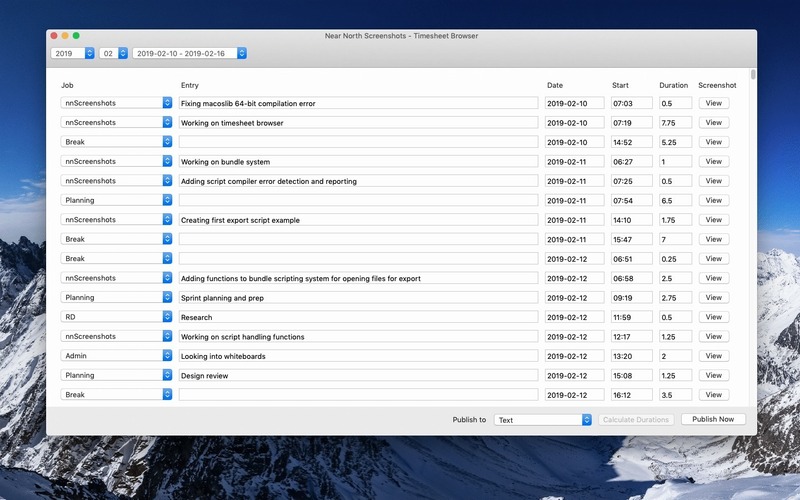 Near North Screenshots is a super easy way to keep a visual record of your productivity to make it easier to fill out timesheets or just to help you review the day. Built in timesheet entries - create your timesheet entries and export them right inside the program. The app can even calculate the duration of each task for you automatically. Bundle support - built in bundles for ClickTime and CSV exporting, write your own bundles to easily support any format. Easy to use timeline interface - scrub through your day, like watching a video. See gaps in your activity immediately. nnScreenshots needs a review. Be the first to review this app and get the discussion started! nnScreenshots needs a rating. Be the first to rate this app and get the discussion started! Set and forget - the software runs in the background, taking up no space on your dock. Recall it with a menu item to quickly review your day. Automatic cleanup - we cleanup old screenshots based on how many days you need to keep a record of. We'll let you know how much space the screenshots are likely to take up so you can avoid filling your drive. 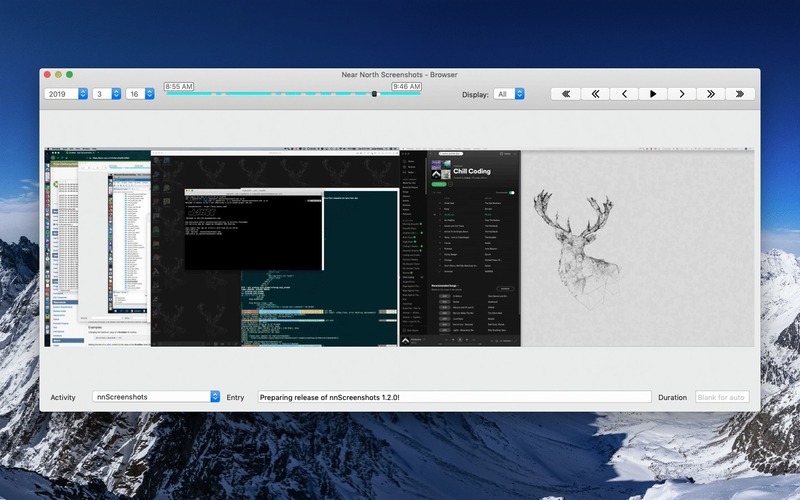 Dark mode - now fully supports Mojave's dark mode. Direct support - the developer is available directly via the support form for support requests. We'll make sure the software works for you! 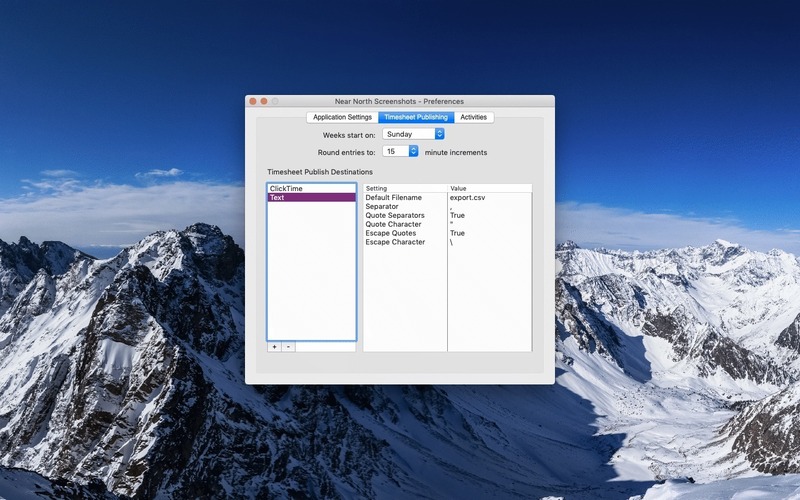 Compatibility - use on all your Macs: our software is tested on macOS Mojave as well as several recent releases of Mac OS X.